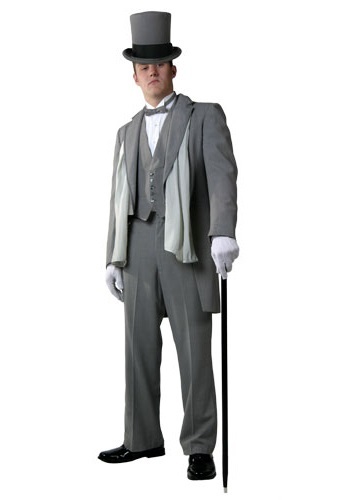 Get that clean and crisp style from the Dickens era with our Victorian gentleman costume! The costume comes with grey polyester pants with typical closure and side adjusters for a comfortable fit. The jacket with tails, vest and tie are the same grey polyester material as the pants. The vest buttons at the neck and clasps behind the back along with adjustable sizes for the correct fit. The shirt is a cotton polyester blend with pleats down the front center for embellishment. There is a satin sash that is worn in true Victorian Dickens fashion and a pair of white gloves to authenticate the look.